The official adidas Telstar 18 match ball for the Soccer World Cup 2018 features Keltan Eco from Arlanxeo. 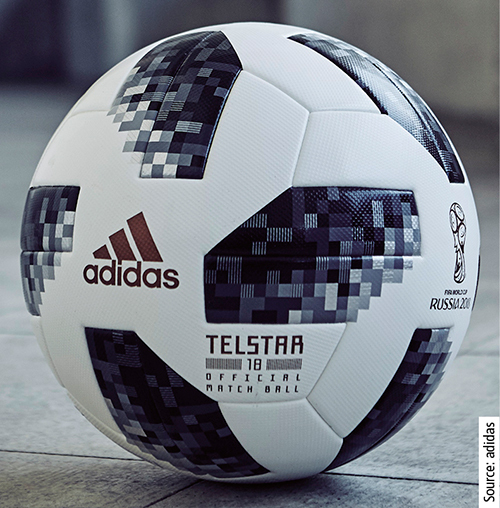 Arlanxeo’s bio-based EPDM Keltan Eco 6950 is the rubber basis for a sponge rubber layer directly underneath the outer cover of the official soccer ball Telstar 18 from adidas for the World Cup 2018. It serves as a mouldable cushion for the ball and supports the bounce characteristics during games. Materials that are used in this layer must meet strict requirements in properties such as density, hardness and weight, and must also demonstrate good processability, said Arlanxeo. The most important performance characteristic, however, is the elasticity and resilience of the layer. According to the company, Keltan Eco is the world’s first EPDM rubber manufactured using bio-based ethylene extracted from sugarcane. Depending on the ethylene content of each rubber grade, the proportion of bio-based material ranges between 50 – 70 %. Keltan Eco 6950, the type used by adidas, is characterised by its amorphous structure and high crosslinking density. This leads to good low-temperature properties and meets the requirements for the best possible elasticity and resilience, said the company. Alanxeo currently offers six different grades of Keltan Eco rubber, e.g., for the sporting goods industry or the automotive industry. In the latter, the material is used, e.g., in profiles for auto body seals, window profiles and other seals.